I was told that the only available coffee cups were in the pile that filled the sink -– a pile of dirty dishes, it was noted, that was indicative of two of the company’s problems. First, that management was unable to make tough decisions. And second that people who had once cared deeply for the company had grown discouraged and didn’t give a damn about even the smallest things any more. When the board told management to cut the payroll, management decided to fire the lowest paid person in the company -– the cleaning lady -– rather than some high-priced-but-ineffective VP. And employees who once cared enough about the company to pitch in and help had long ago thrown in the towel and given up working very hard. At that moment, something inside me said, “Take off of your jacket and tie, roll up your sleeves, and clean the kitchen.” Two of the four workers quickly exited –- I now realize to spread the word about the new, crazed COO -– while the other two pitched in and helped me clean up. The time cleaning was well spent. These two were a wealth of information about what the company’s problems really were vs. the conflicting views I obtained from various board members. And I loved the look on the CEO’s face when he walked in just as we were nearly finished, shook his head, turned, and headed towards his office: He clearly understood that things were going to change at the company he had founded! When nearly done with the dishes, I asked for a couple of favors: Could they ask HR to see if the cleaning lady was willing to come back to work starting today. And could they spread the word that the next person I caught leaving a mess for their fellow employees to clean up –- be it a dirty cup, some sloppy code, or an inaccurate sales forecast –- would be shown the door. Turns out I never had to show anyone the door. This ended up being one of the easiest turnarounds. The ‘hangers on’ who were just there to collect a paycheck -– including two of the VPs –- quickly realized that the best course of action was to find the exit door on their own. And those key individual contributors — the most important ingredient for a rapid turnaround — rose to the occasion, allowing us to reach sustainable profitability within the first quarter. Oh, and yes; you could walk into the kitchen at any time and it was clean; just like the code in the next release of software and just like the sale forecasts for the next quarter! And to think it all started with a pile of dirty dishes! This entry was posted on 8 October 2012 at 6:10 PM and is filed under Business, Change Agent, Des Pieri, Desmond Pieri, Interim, Interim Management, Top Chef, Turnaround. You can follow any responses to this entry through the RSS 2.0 feed. You can leave a response, or trackback from your own site. Des – Nice post…I am increasingly appreciating your “Change Agent” approach and talents!…and if Wednesday works, you’ll fit it great! You remember I mentioned I actually got out of the 9:30 class at 10:20ish…it was because a few of us hung around to chat, finish the mango daiquri’s, and do the dishes! I see that some things never change. Doing dishes, ironing shirts? Obviously the value of the dish washing episode was getting the scoop from those who helped you, not the clean mug for you to drink from. Two suggestions: Try bringing your turnaround expertise to the non-profit world. This is my ballywick. Also, ever think about writing a book? You tell interesting stories. There might be something here. Sean, thanks for the kind words about the stories being interesting. As for a book, writing these posts makes me have the utmost respect for authors who can make an entire book an interesting story! I find it takes hours and hours to come up with just a few minutes of interesting text. I don’t think I have it in me to pull off an entire book. As for ‘non-profit’ it would work but only if there is fear that one can get fired. I’m in technology where there are no unions and the only ‘rights’ one has vis-a-vis a job is that you’ll get paid for the hours that you have already worked today; there is no guarantee that you’ll even have a job after lunch. It’s only when there is this underling fear of losing one’s livelihood that these techniques work. As me to be a change agent for the MBTA and I’d fail miserably. Let me start by saying, that I am absolutely delighted to find your blog. Interestingly enough, I found it by reading your response to Larry Cheng’s (Thinking About Thinking blog) post only shortly after to realize Jules (who I follow on Twitter, read her blog, and at one point was interested in joining her as an operations “guy”) is your wife. That all said, I have fallen in love with the craft of business operations pretty early in my career, though I started as a talent agent (heck, I have a degree in the entertainment industry and talent management). One of the reasons I am so passionate about those “nuts and bolts” of the business is, because I learned how powerful of an impact one can have by rolling up the sleeves, getting dirty, and getting stuff done. This ability seems to disappear over time in many other professions. Another point I wanted to make, man who I quote a lot, since he had so much impact on me – my father, always used to tell me that the best leaders have much dirt under their nails. He used to tell me that even as a CEO, he was always prepared to go plunge that toilet, if his maintenance person was out sick that day. I never forgot that. But there is a bigger reason for keeping those sleeves rolled up and those hands dirty: the moment you stop getting your hands dirty, that is when you become victim of basing your decisions on the information you have received down from the “brown nose channel”. Corporate cockroaches fear action-biased people. Lastly, two of my last companies I have been in, all in the first weeks of me joining I had to call in almost all male employees and tell them our admins were not their maids. Any dishes left went into garbage. You trash a favorite mug or two and they start getting it. 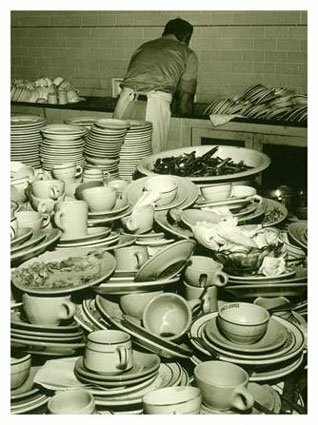 I can’t tell you the number of times I have washed dishes at some small (and not-so-small) companies. I think the truest test of a conscientious and hard working employee is how they treat the common area, in particular the kitchen! Great post! Great story and an enjoyable read. Helpful in establishing the culture and leadership at SocialGrow. I love your approach. Just roll up your sleeves, do some of the dirty work, respect everyone, and good will follow. Could and should be applied everywhere, everyday. Nice way to set the tone. Leading by example is a great way to start.